Good morning, Friends! Well, what a surprise! A nice one, too! It's raining! We really need the rain. And it even thundered!! A spring storm! However, the mountains will be getting the snow and that's good, too! Things will really start to green up now. I guess it is supposed to get below freezing tonight and perhaps tomorrow night which isn't great for the fruit trees around here. So I hope that their crops aren't affected too much. I do love the peaches!! I will be meeting Becky for some brunch and then it's off to a full day of stitching! I haven't done that in a long time so that will be nice! Maybe I can get something done. Today's card was inspired by the sketch at Freshly Made. I am always trying to think of ways to incorporate the new foil designer vellum. Love that stuff! And I think today's card really goes with the weather outside right now - lol! There you have it! Have a super day and thanks for stopping by! This is so charming, it really stands out the FMS gallery this week! LOVE this! Great job! Thanks for sharing at Freshly Made Sketches! Great design! 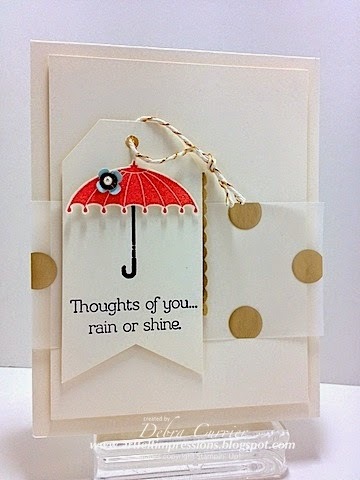 I love the polka dots with this theme, and the brightly colored umbrella is perfect! Thanks for sharing with us at Freshly Made Sketches! Love, love, love this! Fabulous use of the sketch! Glad you joined us this week at FMS!